Guts and Glory Tennis continually playtests and evaluates strings with the goal of identifying the best performing strings for our customers. Modern technology has allowed the production of poly-based strings to take quantum leaps forward in terms of overall performance. Guts and Glory Tennis has been on the cutting edge of these advancements and has consistently been the first to offer the top performing strings to our customers. The WeissCANNON series of poly-based strings clearly ranks at the very top of these offerings and we are pleased to be the US distributor for WeissCANNON. Scorpion distinguishes itself from other poly-based strings as the chemical makeup has ramped up the power quotient while still delivering a comfortable stringbed offering pinpoint control. This string is tension sensitive and when the correct tension is identified it is a string that will woo and wow many users. "It's All About the STING When You Are Using this String!" Construction: Monofil CoPolymer made of high grade polymers and special chemical additives that are monomix reinforced. This unique construction allows for added power,comfort and control with solid tension maintenace. Advantage: If you are seeking added power from your poly-based stringbed, this may be the string for you. Scorpion is a top performing poly-based string and is one of the few at this grade to be available in a neutral color. Plays well as a full string job as well as a hybrid. Why We Carry This String: It offers our customers a welcome blend of added power and comfort. Plays extremely well in hybrid. Specifically it plays terrific as a main string with a WeissCANNON SuperCable Pro cross string. We won't be undersold on any WeissCANNON, MSV, Topspin or Signum Pro product. If you find a lower price from an authorized seller just contact us with the source and we will match or beat the price. If you find a lower price from an unauthorized source, such as ebay, contact us and we will try to match it or beat it. It's all about the "Sting" when you are using this string! If you are seeking the performance and control of a poly-based string with some extra power on your shots, then the WeissCANNON Scorpion may be just the string for you! The Scorpion offers solid all around performance along with surprising power, comfort, durability, spin potential and resistance to movement. Hard hitters will really appreciate this string. Go ahead and swing away with confidence...It's going in. You will feel the exhilaration, while your opponent feels the sting. CONSTRUCTION: Monofil poly-based string made of high grade polymers and special chemical additives that are monomix reinforced. The construction of this string allows for added power, comfort and control with solid tension maintenance. ISO 9001 = Certified Quality Standard for absolute reliability in the manufacturing of this product. ADVANTAGE: An unusual balance of power, control, comfort and durability. Arguably one of the top performing poly-based strings to be available in a neutral color. COMMENTS: The overall solid performance of this string and added power makes it an excellent choice for today's heavy hitters. This string plays solidly as a full poly set-up and also shines brightly in various hybrid applications. The manufacturer recommends installing 8% less than your regular tension, but this is not always necessary. This string plays terrific once the optimal tension is identified, which may require a stringing or two. If strung too tightly the playability and comfort are not realized and the string can be perceived as an ordinary copoly. Finding the correct tension will unlock the potential and the user will reap the benefits of this solid string. The Scorpion is a popular choice of string among tournament playing juniors. In summer 2010 sales of the Scorpion reached new heights as players all over the globe began to discover the quality of this product and demand exceeded supply causing a worldwide shortage and uproar from longtime users. Why not conduct a personal playtest today? We have tried to make it easy by allowing you to place a set or more in your shopping cart directly from the left column of this page. 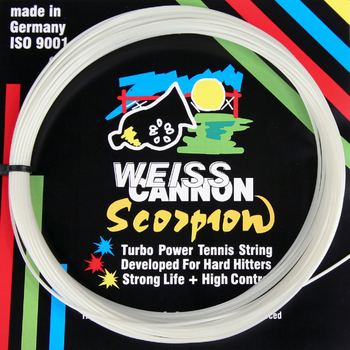 Please follow the WeissCANNON Scorpion 660' Reel link if you prefer to save money by ordering in larger amounts. This is a great all around poly. Like a jack of all trades, it does everything well. I love it as a hybrid in the mains. I really recommend this and silverstring are a must try to compare. First time using this I was stunned, it was very difficult for me to believe that once and for all a brand have found a way to bring into polyester universe what seems to be impossible to get, the pocketing, the feeling, comfort, steel feel solid, that without loosing the spin potential, the control but adding a way much stronger ability to hold the tension and playing characteristics during the all string life, saying these it seems pretty obvious to me that Weiss Cannon has overpasses everything available in the string tennis world of today, for me that knows almost all the strings available on the market, this is for sure the top brand nowadays, those who look for nothing but the best have the chance to choose this as their winner tennis partner.